When you live with boys and men (larger boys, really), one thing is inevitable– farts. For some reason, men love their farts. The first time my husband told me that he and best friend Steve used to light their farts when they were boys, I was appalled. But then I got to thinking, even back when I was a kid, my family (not my mother) joked about farts, or “poops” as we called them then, not to be confused with real poops, which we called “big duty.” (Don’t ask me why). Anyway, whenever my father “pooped,” he would say– “better out in the big world than in my little stomach” (Or was that for burps? I can’t really remember). 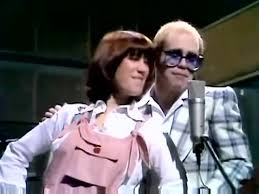 In any event, the other day as I was listening to Elton John and Kiki Dee Sing “Don’t Go Breaking My Heart,” I realized that this song was just begging to be parodied. I couldn’t help myself. Better out on my blog than inside my tiny brain, which is already crowded with other random thoughts and useless information. Happy Friday. This entry was posted in Just for Laughs, Parodies and tagged Don't Go Breaking My Heart, Elton John, farts, Kiki Dee, Wierd Al Yankovic by Renata Manzo Scruggs. Bookmark the permalink.